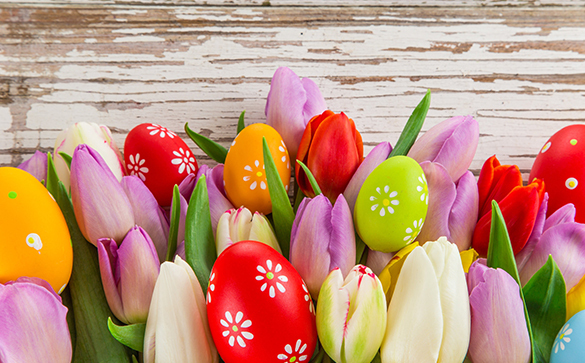 Celebrate Easter with a special brunch menu that includes braised lamb quesadilla with fresh avocado and fruit salsa; roasted lamb shank served Moroccan style with couscous, plums and almonds; and lobster Benedict with spinach, avocado, truffle hollandaise and breakfast potatoes. Full brunch menu will be available and will be served from 11 a.m. – 3 p.m. For more information, call (561)623-0822. Batch New Southern Kitchen – 223 Clematis St. Enjoy some southern hospitality this Easter Sunday as Batch New Southern Kitchen host its Easter Sunday Funday. Offerings include their famous brunch, bottomless drinks, and scratch-made pastry specials; Bloody Mary samplings will also be available. For more information, call (561)708-0000 or visit batchsouthernkitchen.com. Bistro 1001 – 1001 Okeechobee Blvd. Bistro 1001 will host an Easter Sunday brunch from 12 p.m. – 4 p.m. Brunch will include the buffet, bottomless mimosas and sparkling wine. The event cost is $48 per person, $24 for children (12 and under) and free for children four and under – tax and gratuity are additional. Reservations are available at noon and 2:00 p.m., and parking is complimentary. For more information or to make reservations, call (561)833-1234 or visit bistro1001.com. The Butcher Shop – 209 6th St.
Bring the family and celebrate Easter with activities including an egg hunt for the kids and a craft beer hunt for the grown-ups. The Butcher Shop will be serving their regular brunch menu along with $28 specials that will include smoked leg of lamb, mint chimichurri, quinoa salad, charmoulsa roasted carrots. Bottomless Mimosas and Bellini’s will be offered for $20. Reservations are recommended. Brunch served from 11 a.m. – 4 p.m. For more information, call (561)812-2336 or visit thebutchershopbeergarden.com. Enjoy an Easter Feast at Duffy’s! Celebrate on Sunday with a 3-course meal with a choice of entrée including roasted turkey breast $13.95, roasted pork loin $15.95, or 10oz Prime Rib $20.95. All entrées are served with a House or Caesar salad and a slice of Red Velvet Cake for dessert. While you’re there, enjoy their signature Peeptini for only $5. For more information, call (561)249-1682. Hullaballoo – 517 Clematis St.
From 10:30 a.m. – 2 p.m. Hullaballoo will be hoppin’ with tunes from DJ Mickhail Mills and $10 bottomless mimosas and Bellini’s. For more information, call (561)833-1033 or visit sub-culture.org/hullabaloo. O’Shea’s Irish Pub – 531 Clematis St.
Easter Sunday, O’Shea’s Irish Pub will be holding its annual Free Pub Poker Easter Egg Hunt. Inside the eggs, there will be free drink tickets, extra chips that can be used to play that night, a golden ticket and other fun prizes. It will be the last Sunday for points before O’Shea’s Season 9 Championship Tournament. For more information, call (561)833-3865 or visit osheaspub.com. Celebrate with family and friends for this eloquent brunch experience from 11 a.m – 3 p.m. Chef Isaac Cerny has prepared a special three course prix fixe menu with menu classics like Spring Pea Risotto, Short Rib Hash, Jumbo Lump Crab Quiche, Dijon and Herb Crusted Lamb Loin, and much more. The special menu is $75 per person ($25 for children), plus tax and 20% gratuity – reservations are recommended. For more information, call (561)833-5090 or visit pistachewpb.com. Open from noon – 9 p.m. Enjoy live Spanish Guitarist from 1 – 4 p.m. Reservations are encouraged. For more information, call (561)514-0811 or visit tapeotapas.com. Easter Egg Hunt at the Ann Norton Sculpture Gardens – 253 Barcelona Rd. Reservations are required. Complimentary to ANSG Family Member levels and above. Admission fee for non-members: $15 Adult, $10 Seniors (62 and above), $7 all Children. Doors open at 10 a.m., hunt begins promptly at 10:15. Please bring your own basket. Three Age Groups: 3 and under, 4 – 6 years old, 7 – 10 years old. For more information, visit ansg.org.